From left, Andrea Ballinger, Dina Vaughan, and Matthew Helm are leaders on the University's LEAPForward initiative. Imagine there’s a freshman at Illinois State named Jane, and she’s struggling. Her grades are slipping, she’s skipping class, and she’s thinking about not coming back for her sophomore year. Now imagine that her academic adviser gets automatically notified when Jane’s grades start to slide, or when she’s missed a bunch of classes. The adviser pulls up Jane’s up-to-date records and meets with her to get her back on track. Before long, Jane is registering for her next semester on her iPhone, with the help of custom course recommendations based on what other students like her have taken. And even when that all-important class in her major is full, she knows what number she is on the waiting list. This is just part of the very near future envisioned by the leaders of LEAPForward, a major campus initiative now in its second year. “We will be able to ask more sophisticated questions about how students are progressing toward their degrees, what classes might be in short supply in a year’s time, and which students might benefit from some extra tutoring,” said Jonathan Rosenthal, associate provost for undergraduate education. On its face, LEAPForward will mean a much needed upgrade for many of the behind-the-scenes (and outdated) technology systems that keep Illinois State running—from financial aid, to course registration, to housing and dining—in hopes of making them easier to use. But more importantly, LEAPForward is Illinois State’s largest step yet into the emerging world of Big Data. The new technology infrastructure being built today will allow administrators, professors, staff, and students to make better decisions by providing easier access to more (and richer) data. So while Hancock Stadium looks like the biggest project underway on campus, that title might belong to LEAPForward, headquartered across College Avenue in the Professional Development Building. “People see structures go up, and while that’s improving the campus, they don’t think of internal information architecture as that exciting, but it’s really going to take us into the next century,” said Dina Vaughan ’89, an associate director and leader on the LEAPForward team. Today, students expect a much different experience because of the consumerization of technology—the same push toward self-service that, say, allows travelers to check into a flight on their iPhone. And in a business as competitive as higher education, students who don’t get that experience might enroll elsewhere, or complain about it to their friends (prospective students) on social media. Today, the Illinois State mainframe is running 44 different applications—one for financial aid, one for admissions, etc. They don’t mesh well together, and each one is extremely hard to tinker with because they were built in-house, with some original coding dating back to the 1970s. Despite good-faith efforts to shield students, faculty, and staff from that “spaghetti” of segregated apps, administrators decided it was time for a universitywide upgrade, said LEAPForward steering team chair Andrea Ballinger. That review, led by the Administrative Technologies eMerge unit, led to several changes right off the bat, including the creation of a debit card to more quickly process financial aid refunds for students. Today, the five-year LEAPForward project, sponsored by the University’s four vice presidents, has around 20 full-time employees, with hundreds of other University staffers, faculty members, and students pitching in part-time. They’ve gathered feedback through focus groups, town hall meetings, and other events. The goal is to replace all 44 apps on the mainframe with a new “academic information environment,” a suite of apps (think Microsoft Office on steroids) that’s hooked into one powerful data warehouse, said Vaughan, who oversees this part of LEAPForward. Vendors looking to provide the bulk of those apps and supporting systems made their pitch to LEAPForward leaders in June. If all goes as planned, the old mainframe will be decommissioned and many of the new apps will be online in time for fall 2015, said Ballinger. For students, they’d log into one place for everything—grades, financial aid, dining, housing, etc.—so they could change their address, for example, with one click. It would also be built for the modern user. 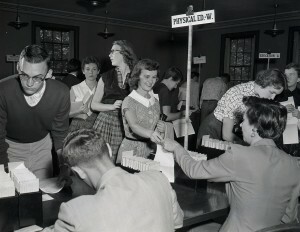 Today’s grade reporting system, for instance, was designed back when grades were physically mailed out, so it’s not prepared for the onslaught of student demand it sees when professors post grades after finals. The new apps would share data much more seamlessly. The Office of Parking and Transportation Services would be able to print off an up-to-date list of students, for example, instead of having to request such a report from the Office of the Registrar. On the flip side, if a student leaves the University, the system could automatically shut off their campus building door access privileges. Beyond the day-to-day business needs of the University, the LEAPForward team says there are larger benefits of having such a robust, accessible data warehouse. 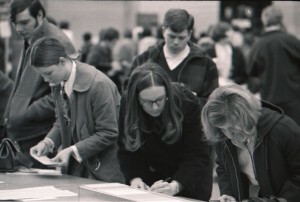 If, for example, the University wanted to increase the number of students studying abroad, analysts could create a “profile” of a prospective traveler by diving into the characteristics of everyone who’s done it before, Helm said. What programs were they in? What was their financial aid situation? Did their siblings study abroad? The power of data decision-making, known as “business intelligence,” is already harnessed in the private sector, Ballinger said. When an airline recently lost Ballinger’s luggage for a third time in 12 months, she complained about it to a friend, who tweeted about the problem. It wasn’t long before the airline called up that friend to ask about the problem and try to solve it, Ballinger said. Likewise, the University could set up automated monitoring systems to listen to social media chatter over the summer. If there’s a lot of griping by incoming freshmen about not getting into a first-year English course, that could be the start of a conversation about adding new sections, Ballinger said. Faculty will use the new student information system to check their class lists and submit grades, making it easier to integrate relevant course data into the online course management tool ReggieNet. And the new “business intelligence” environment will also make it easier to ask meaningful questions on the data within ReggieNet, said Mark Walbert, associate vice president for Academic Technologies. For more updates on LEAPForward, check on the initiative’s website or Facebook page.